According to recent data released by HubSpot, a majority of marketers recommend that websites be redesigned or updated every 13-36 months. When was the last time that you redesigned or updated your website? Sometimes it’s not so easy to decide if you should allocate the time and money necessary to overhaul your business’ website. If it ain’t broke, don’t fix it! – Right? It’s not mobile responsive. If your website isn’t mobile responsive, stop right now and update your website. Do not pass go. As of April 2015, search engines take into consideration whether or not your site is mobile responsive when determining page ranking. Since mobile search is quickly overtaking desktop search, this should be incentive enough for you to make the switch. Furthermore, 62% of companies that designed a website specifically for mobile had increased sales. Mobile responsive sites are the way to go in 2015. You’re not sure how to update the content on your site’s pages. Your website should be a constantly changing extension of your business. Your business services, products, news and company information rarely will stay the exact same for over one year at a time. Your website shouldn’t stay exactly the same either. 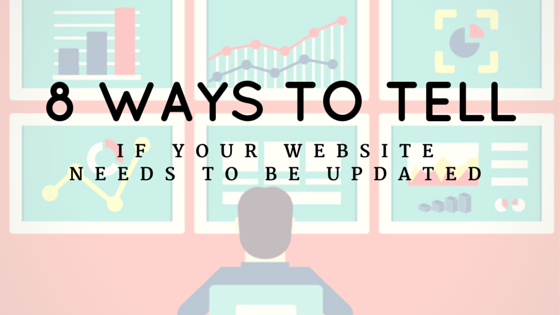 If you are unsure how to update the pages on your site, add a page, or post a blog entry, it may be time for you to consider changing your site to allow you to do this. There are no links for social media. If you have social media profiles, you should have their buttons on your website. Having social media links on your website will help your site visitors find you on social media. They will also demonstrate to the viewer that you are dedicated to being available for them. Social media pages are an extension of your website and your company. They are another means of contacting you, learning more about you and seeing reviews. Make sure people can easily find them! You don’t have a blog. One of the best and simplest ways to increase your SEO traction is by writing and posting blog entries. Creating new content on your site gives viewers an incentive to come back to your website frequently, and it also creates a new page for search engines to index. If you don’t have a blog on your website, consider adding one to your site soon. It’s not easy to find the pages you are looking for. Clear navigation is key. I don’t know about you, but I get so frustrated when I go to a website and I cannot figure out where to find the “Contact Us” page. On top of that. if that page doesn’t clearly list the address and phone number, I’m out of there! Having a navigation that is clear and easy to understand will increase the time that people spend on your website and hopefully decrease your bounce rate. Since the goal of your site should be to inform your prospects and convert leads, keeping them engaged and on your site is of utmost importance! At the point when you redesign your website, make sure to spend time defining a clear site map with navigation. It takes a long time for your web pages to load. 40% of people will abandon a web page if it takes more than three seconds to load. If your pages take too long to load, your website is useless! People will be immediately turned off. In most cases, they will give up on you and go find someone else who has a site that loads properly. And that person will probably be your competitor. Your website traffic has been declining. If your Google Analytics or HubSpot Sources page has been looking a little droopy lately, this can be a sign of a bigger problem. If your traffic is consistently declining and has been for consecutive months, it might be time to consider a redesign. It’s been 3-5 years since your last revamp. 5 years ago, Miley Cyrus still had long hair. Don’t be the outdated Miley of the Internet. When was the last time you redesigned your website? If it’s been awhile, what is the main reason you haven’t redesigned your site yet? Let us know in the comments below! If you’re interested in learning more about website design or GRM’s design services, click the button below. Are You Making These Mistakes With Your Digital Marketing Measurement?